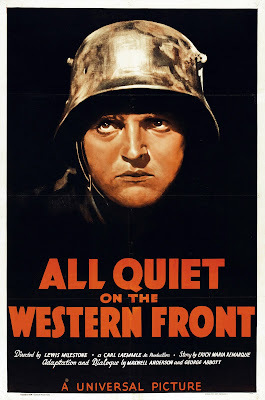 All Quiet on the Western Front (1930) is one of the 1001 classic movies you should see. 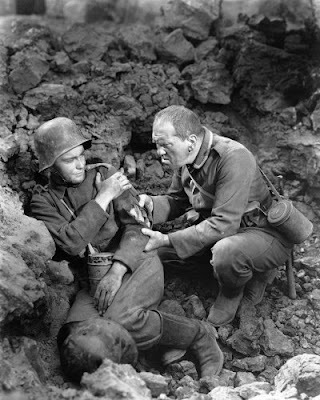 This drama about German soldiers in World War I stars Lew Ayres (left) and Louis Wolheim. Each Friday, I'm going to recommend a classic movie you should see (for the reasons behind the 1001 series and reviews of earlier films covered go here). This month I'm commemorating the 100th anniversary of the United States' entry into World War I by covering four films about the conflict. First up is the landmark antiwar film, All Quiet on the Western Front (1930). All Quiet on the Western Front follows a group of German schoolboys who are persuaded to volunteer for the front lines by their professor's patriotic platitudes about the Fatherland. The boys have been told that fighting for Germany is a glorious and heroic occupation that will earn them dozens of medals, but, when they get to the front lines, they find a very different reality. They are subjected to disease, vermin, unsanitary conditions and constant shelling while they crouch in the muddy trenches trying not to get killed by a random bullet. The boys are picked off one by one until only one (Lew Ayres) survives. All Quiet on the Western Front is based on a 1928 novel by German writer Erich Maria Remarque, who served in the trenches during World War I. Universal Pictures producer Carl Laemmle, Jr., brought the rights in 1929 for a lavish prestige project helmed by director Lewis Milestone and starring relative newcomer Lew Ayres. The result was a landmark film that earned critical accolades and became the first talkie to earn a best picture Academy Award. World War I was the most significant event of the 20th century, and its impact reverberated throughout the old Hollywood studio system. Silent stars like Charlie Chaplin, Douglas Fairbanks, and Mary Pickford enthusiastically supported the war effort by selling millions in Liberty Bonds, but old Hollywood's approach to the conflict changed drastically in the decade after the conflict. All Quiet on the Western Front is the best-known among a vanguard of films made in the silent and pre-code era that showed the conflict as a brutal and futile quagmire that wasted the lives of an entire generation of young men. 1. The battle scenes. Milestone used real World War I veterans as extras and advisers in the frighteningly realistic battle scenes that make up a large portion of the film. The use of sound here is quite effective: The relentless bomb blasts, which carry on uninterrupted for about 30 minutes in the middle of the film, give even home viewers a small taste of the horrors of living in the trenches. 2. Banned film. All Quiet on the Western Front has the distinction of being one of the most banned films of all time. It was picketed in the U.S. for being antiwar propaganda, banned in Poland for depicting German soldiers in a positive light, and, most significantly, banned by Nazi leaders. Hitler's propaganda minister Joseph Goebbels went so far as to release rats into movie theaters that dared show the film. 3. Steven Spielberg. The director credited All Quiet on the Western Front as a major inspiration for his films Saving Private Ryan (1998) and War Horse (2011). 4. The final scene. This film features what is perhaps the most powerful ending in film history (you can see the clip here). Milestone superimposes the ghostly images of the dead soldiers over a military graveyard. One-by-one they turn and face the audience in what amounts to a silent plea for remembrance. 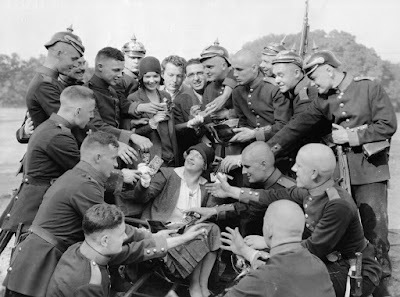 Beryl Mercer (she plays Lew Ayres' mother in the film) surrounded by the cast of All Quiet on the Western Front (1930). Other critics: All Quiet on the Western Front has an 100 percent fresh rating at Rotten Tomatoes and Leonard Maltin writes that it is a "vivid, moving adaptation of Erich Maria Remarque's eloquent pacifist novel about German boys' experiences as soldiers during WW1. Time hasn't dimmed its power, or its poignancy one bit" in a 4-star review in his Classic Movie Guide. Critics in 1930 immediately recognized the film's almost uncanny ability to convey the horrors of war. New York Daily News critic Irene Thirer raved that All Quiet on the Western Front was "so magnificent, so powerful, that it hardly behooves mere words to tell of its heart-rending appeal." The Variety critic also acknowledged the movie's powerful message. "The League of Nations could make no better investment than to buy up the master-print, reproduce it in every language, to be shown in all the nations until the word 'war' is taken out of the dictionaries." The bottom line: All Quiet on the Western Front is simply the best antiwar film ever made in old Hollywood or anywhere else. It is both a remembrance of the millions of men who gave their lives in the conflict and a warning to future generations about rushing headlong into armed conflict. Availability: All Quiet on the Western Front is available on DVD and video on demand. Next Friday I'll continue the June theme by looking at the 1940 film The Fighting 69th, starring James Cagney.